If you have a Funding Advantage major medical plan, you have phone and PC access to a health provider 24/7. For minor health issues like a cold, flu, allergies or a sprained ankle, telehealth is rapidly becoming the favored way to seek immediate help. Call 855-236-9411. If you've not used the service before, you will first be asked a few qualifying questions. Or, use your PC to access your Allied Member Connection account. You will need to get registered on the Member Connection site, if you haven't already. 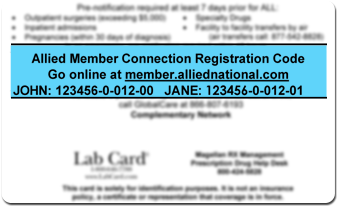 Check the back of your health plan ID card for your registration code. Once registered, go to the site, click on "Start a Virtual Care Visit" and answer a few qualifying questions to get access to MeMD telehealth. Once you complete these steps, you can have a phone or video consultation with a health care provider. MeMD telehealth providers can prescribe medications where allowed by law. Click the image below and download our informational flyer about your telehealth benefit - an important part of your Allied Funding Advantage health plan. ​To determine if you have access to Member Connection and MeMD telehealth, check the back of your health plan ID Card.